Knitting has the ability to tell a story. Alice Hoffman and Lisa Hoffman, authors of FAERIE KNITTING, tell a series of tales about love, loss, trust, and perseverance. Each chapter brings about a new knitting pattern for readers to discover and create from the world of Faerie Knitting. From the Blue Heron Shawl and the Love Never Ending Cowl, to the Three Wishes Mittens and Amulet Necklace, each project is as wearable as it is magical. 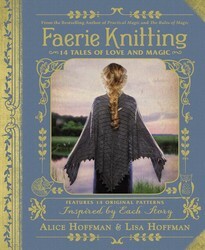 Find new knitting patterns in FAERIE KNITTING by Alice Hoffman!